AZ Wildfire | #LongFire | New! FLAGSTAFF, Ariz. – Firefighters were dispatched to a wildfire that broke out near Long Park, approximately 2 miles southwest of Mormon Lake Village on the Coconino National Forest. The fire was said to be at 5 acres. USDA Forest Service firefighters were said to be in the process of securing a containment line around the wind-driven fire and suppressing spot fires. Fire personnel and resources include 3 engines, 2 water tenders, 1 bulldozer, 1 (20) person Type I crew (hotshot) and 1 (20) person Type 2 crew (AZ DOC Winslow Facility). 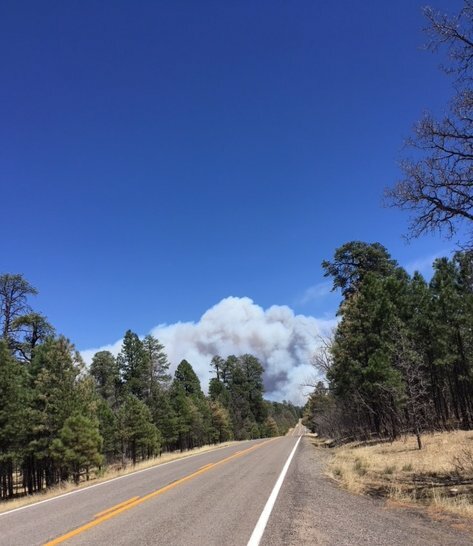 There are no evacuations currently in effect at the moment but the Coconino County Sheriff’s Office will be monitoring the fire and will make a Public Service Announcement should there be any in the near future. No injuries have been reported to firefighters or to civilians. NM Wildfire | Mesa Hill Fire | New! ACOMA, N.M. – A wildfire dubbed the #MesaHillFire is burning near Acoma in New Mexico that was reported on Sunday, April 29, 2018. Its proximate size is about 10 acres and located at 35 3.588, -107. 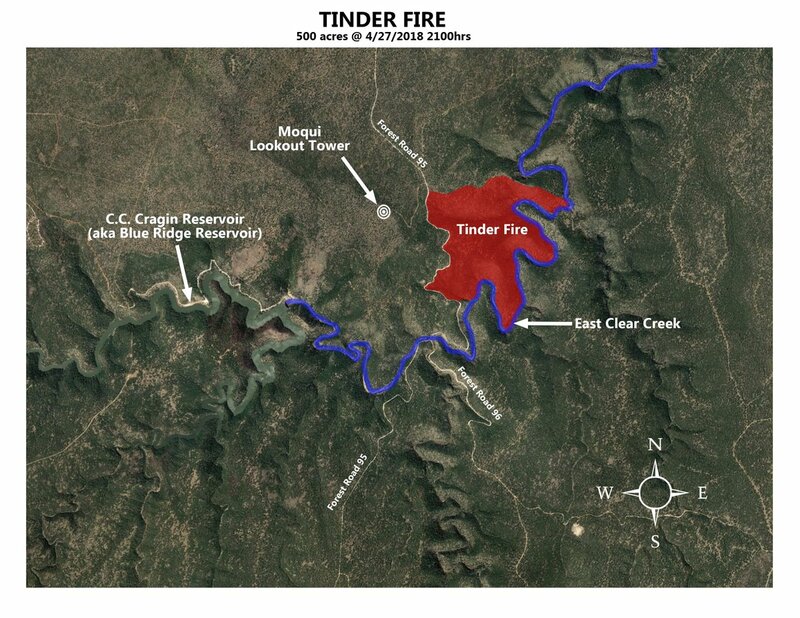 #TinderFire | Arizona | NEW! EAST CLEAR CREEK, Ariz. – A wildfire that ignited originally about 1.5 miles NE of the Blue Ridge Reservoir on Friday, April 27, 2018, is said to be human-caused. An exact ignition source is unknown at this time. There are approximately 500 personnel including 7 hotshot crews, 3 initial attack crews, engines, bull dozers, helicopters and overhead teams. Incident Cooperators include Coconino Emergency Management and Coconino Sheriff’s Office. Fire fuels consist of timber, pine and mixed conifer that include grass and understory. There has been 500 acres consumed. Officials are recommending that you travel north on Hwy 87 to Winslow. SB roads are closed. Red Cross Shelter has been set-up at Winslow Jr. H.S., 1100 N. Colorado Avenue. Animal Shelter has been opened for dogs and cats at the Winslow Animal Lake Shelter, 548 Barrigan Rd, Winslow, AZ 86047. Large Animal Shelter is open at the Holbrook Navajo County Fairgounds. CA Wildfire | Grape Fire | New! REDDING, CA – The Sims Restoration Project area prescribed burn has officially been declared a wildfire on Thursday April 26, 2018. It is burning about 10 miles north of Hayfork, California. The fire was originally reported on April 24, 2018 at 1659 hours PDT. There are approximately 168 personnel assigned to this wildfire. The IC attached to this incident is Paul Johnson. Alongside staffing there are an unknown number of engines, hand crews, fallers and bull dozers that are building containment lines around the fire perimeter. Additionally, there is an attack plane and a Type 1 helicopter being used as aerial fire suppression resources. Incident Cooperators include those from the Six Rivers and the Shasta-Trinity National Forests. There has been about 150 acres of heavy brush and timber and grass has been scorched but fire crews have successfully reached a 10% containment status. Fire fuels are drying out much faster than expected and causing fire behavior to become more intense. Fire crews are also working together on structure protection which includes public/private properties, water systems PG&E transmission lines and natural forest stands. Incident Summary | The Diener Canyon Fire ignited when a spot fire escaped from a Prescribed Fire about 7 miles south of Bluewater on the Cibola National Forest in New Mexico. This occurred on Thursday on April 12, 2018, around 1600 hours. Fire Officials are estimating the containment date to be around Thursday on May 31, 2018. Resources | There are now 55 fire personnel along with 4 engines and 2 helos. This fire is being managed an Albuquerque Type 3 IMT took command of the fire on April 22, 2018 at 0600 hours. Size Up | Fire behavior is minimal with backing, creeping and smoldering. There has been 9,338 acres of ponderosa pine litter and short grasses that has been consumed. It is burning within the old fire scar from 2004. Fire crews are currently mopping up and securing existing containment lines. They will continue with rehab work. A 92% containment status has been reached. Damage Assessment | Fire suppression and containment costs have reached a high of $2,800,000. Incident Summary | The Rattlesnake Fire started on April 11, 2018 around 1330 hours MST, about 43 miles SE of Whiteriver and 20 miles SW of Alpine, as well as 50 miles NW of San Carlos, Arizona. It is said to be also burning on the Forth Apache and San Carlos Indian Reservations and the Apache-Sitgreaves National Forests. Resources | There are approximately 545 personnel alongside 14 crews, 17 engines and 4 helicopters. assigned to IC Jeff Andrews with the SW Area IMT Team 5. Size Up | Around 16,891 acres of timber (litter and understory), one foot of short grass and heavy logging slash have been consumed. Fire crews have reached a 25% containment status. There has been 0 structures lost but fire suppression and containment costs have soared to $5.2 Million to date. A structure fire was reported in the area of Hwy 64 at mile post 216-17 that occurred on Monday, April 23, 2018, spread into the wildland interface. Officials state the fire was observed moving in the northeast direction as it burned through pinyon juniper and short grasses. There are currently 50 personnel assigned along with IC Adam Paul with the KNF. Though it could have been much worse, crews alike have stopped the forward progression of this fire and is currently being held at 160 acres with the initial report of 35 acres. There has been one structure lost and several others under current threat which means there is a pre-evacuation notice that has been issued for those within five miles of the fire. Evacuation can been received by calling the Coconino County Sheriff’s Office at 928-774-4523.